Using FIBC bulk bags is a great option for storing and transporting all sorts of products in bulk. 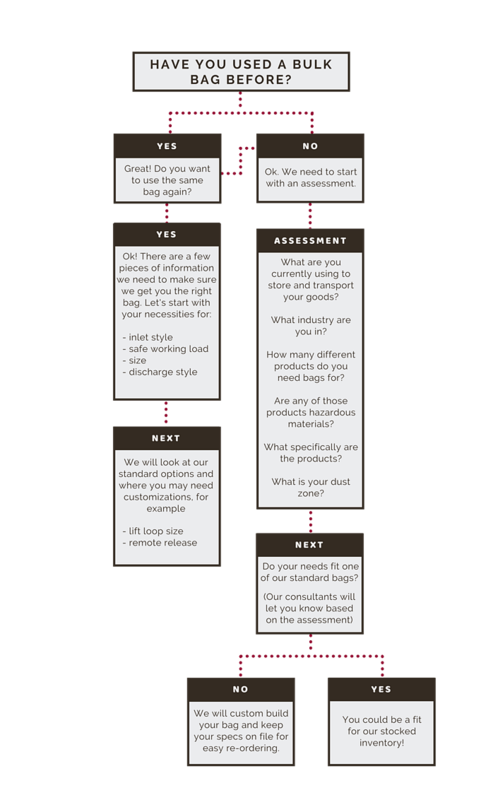 As a first time FIBC buyer, you may have a few questions about bulk bags, what bag to use and how to order. Don’t worry! Our team at Conitex Sonoco wants to make sure you feel taken care of, every step of the way. Check out our FAQs for first-time FIBC buyers, and let us know if you have any lingering questions. What is the process to place my first order? What materials are bulk bags made with? The most common material used in FIBC construction is 100% virgin polypropylene. The fabric includes ultraviolet (UV) resistance and is manufactured to meet standard FDA/ food grade requirements and 5:1 safety standards. What are the different parts of a bulk bag? These bottoms also come with options for closures including star (also called pedal or iris) and string (also called pajama). You also have the same options for ties as you do for inlets. Can FIBCs be used in flammable or combustible environments? It depends on the bag. 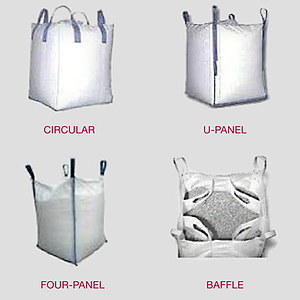 If the bulk bag is made from Type C or Type D fabric, then yes, they are designed to be used in these environments. Type C bags, or conductor bags, are made of woven carbon filament that prevents electrostatic sparks that could cause explosions as long as you ground them when filling, moving or discharging. Type C bags are used to safely transport flammable powders in environments where flammable solvents or gases are present. Type D bags, also called static dissipative bags or antistatic bags, also prevent dangerous sparks and static discharges but do not require grounding to ensure safety. 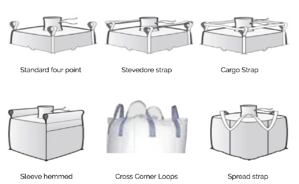 If you are unsure of which you need, bulk bag consultants can be a great resource or learn more about the different types of FIBC fabrics here. How do I know if I need a UN Certified bulk bag? To protect people, products and the environment, every country has different processes and regulatory systems for handling hazardous materials. To help ensure safe and consistent handling of dangerous goods, the United Nations Economic and Social Council created the Committee of Experts on the Transport of Dangerous Goods to create a set of regulations on the legal responsibilities of packers, loaders, vehicle owners and drivers. These regulations are part of the UN Model Regulations called UN Recommendations on the Transport of Dangerous Goods. According to these regulations, if you are transporting substances that fall into one of the UN’s Dangerous Goods classes, it must be packed and shipped in UN certified packaging, regardless of your transportation method by land, sea or air. Learn more about UN Certified bags here. How long does a UN certificate last? UN certificates normally last one year from the testing date. Some bags remain certified for up to three years, but be sure to check your certificate, or ask your manufacturer for more details. How do I know if a bag is safe for food handling? AIB - The AIB International certification is for food safety and grain-based production capabilities. GFSI - The Global Food Safety Initiative sets food safety requirements for certification programs. HACCP - The Hazard Analysis and Critical Control Points management system analyzes food safety by identifying and monitoring potential biological, chemical and physical hazards. From raw material production, procurement and handling, to manufacturing, distribution and consumption of the finished product, the HACCP system reduces the risk of these hazards occurring. FSSC 22000 - The Food Safety System Certification 22000 provides a framework for effectively managing your organization's food safety responsibilities. FSSC 22000 is fully recognized by the Global Food Safety Initiative (GFSI) and is based on existing ISO Standards. It demonstrates a company has a robust Food Safety Management System in place that meets the requirements of its customers and consumers. ISO 22000:2005 - The International Organization for Standardization specifies requirements for a food safety management system where an organization in the food chain needs to demonstrate its ability to control food safety hazards in order to ensure that food is safe at the time of human consumption. SQF - The Safe Quality Food System requires the application of Hazard Analysis and Critical Control Point (HACCP), built upon a sound foundation of prerequisite programs such as Good Manufacturing Practice (GMP), Good Hygiene Practice (GHP) or Good Agricultural Practice (GAP) to document and control critical food safety and quality criteria during production in order to deliver a safe, quality product as specified. QS - The QS certification mark stands for certified quality assurance of fresh food – from farm to shop. The quality scheme for food covers all stages of the food chain. How fast can I get a bulk bag order delivered? For Conitex Sonoco’s in-house bulk bag brand, BulkSak®, we keep a stocked inventory of standard spec FIBC bulk bags ready at our facilities for rapid delivery. Our six US-based locations with in-house support, have thousands of items in stock every day that are ready to ship. Most stocked bulk bag inventory ships same day when ordered before 1:00 p.m. EST. Download our catalog of stocked inventory bags here. I may need to place huge orders of custom bags, but I don't have a place to store them. What do I do? For our clients who place large orders without housing capabilities, our Vendor Managed Inventory (VMI) program keeps your orders on hand in our warehouses. Think about it like a custom reserved stock setup. With long lead times for custom products, we understand that you need to be prepared for surges that affect your inventory and production. We will hold a portion of your order until you are ready to receive it, and will never slow your production. With multiple warehousing locations on the East Coast, Texas, and the West Coast, your stock is stored domestically for quicker delivery, often with same day shipping. What if I’m still not sure what bag to use? Not a problem! We have dedicated product advisors at our manufacturing facilities around the United States. You can think of our people as your people with the high level of customer service you can expect from our regional sales managers. Our Regional Sales Managers are your consultants, leveraging our experience in manufacturing and production and applying it to how you do business. Depending on your needs, we may start with an in-house consultation with a Conitex Sonoco bulk bag engineer who will meet with you in person to understand your product needs and your production process, ensuring that the selection of packaging is optimized to provide you with the best combination of cost and productivity. Our team of engineers can help you create a custom bag for your needs that will stand up to all of your quality standards. Your order is not complete once it ships. Our regional sales managers conduct in-house visits to see your custom ordered products in use, to ensure that the product is performing to the best standards. If you have any questions about your bulk bag orders, let us know! We are always happy to help.